Apr 1 2004: Just 4 days young and you would look at everything so curiously. 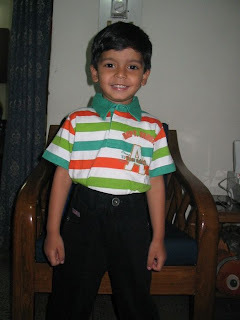 March 29 2005 : An year young today and your lovely smile and giggles would enlighten any heart! March 29 2006: On your 2nd birthday. You had started to become a bossy little man but still as adorable as ever. March 29 2007: 3 yrs and you would amaze us with little little things that you would do. March 29 2008: By 4th birthday you had become a total brat! 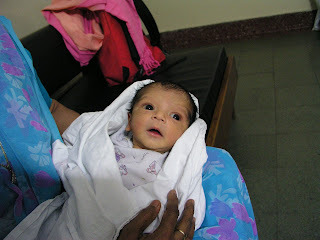 March 29 2009: 5 years today and you have already started giving us threats of leaving us ;) but then Mumma Gogi bestest! Happy many returns of the day Betu ! :) Sweet post. Lovely snaps ..esp the second one ..why have I not seen that snap earlier :O Its such a cute pic ! wishing you a bright year ahead and lots of fun! may this year be filled with newer discoveries and joys and happiness throughout! Very nice post and happy birthday to Anirudh. I am visiting your blog for the first time and liked it very much. Wishing Betu a VERY HAPPY BIRTHDAY !! He rocks !!!!! Loved the way you had put the pics of each of his five birthdays. Wishing him many happy returns of it. I love the way he talks !! Lots of hugs and kisses to him.